This is the third adventure from the keyboard of Ken Bond that the reviewer has played, and good adventures they have proved to be, tills one being no exception. 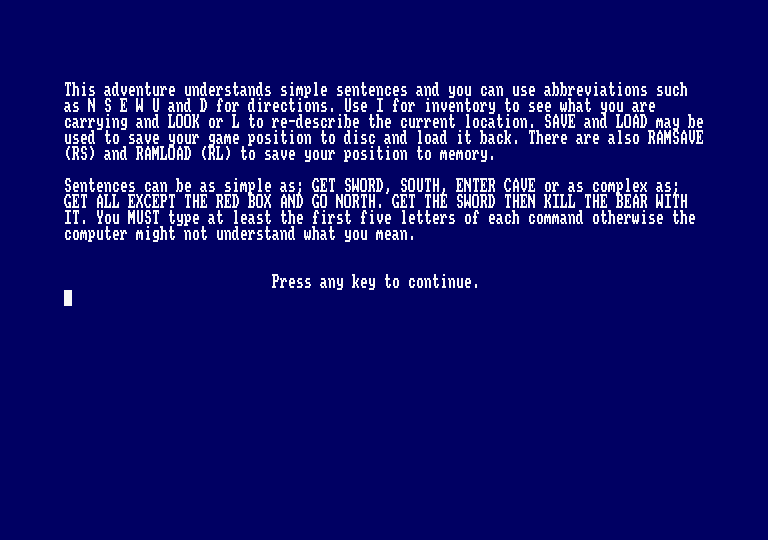 The adventure contains the usual logical puzzles and atmosphere which means a good text adventure. When you load the adventure, it tells you to "Save" often “To tape” when you get inside the Castle. The adventure does however save to disc automatically, it asks your for a file name and then saves. Type “Load” and then when asked “The filename” to get back to your saved position. SAVE A LOT... you must do, to succeed. Note that the adventure will not load with peripherals attached (ie. Rombox and Multiface 2), so if you have them attached, you must just pull the connecting plug! 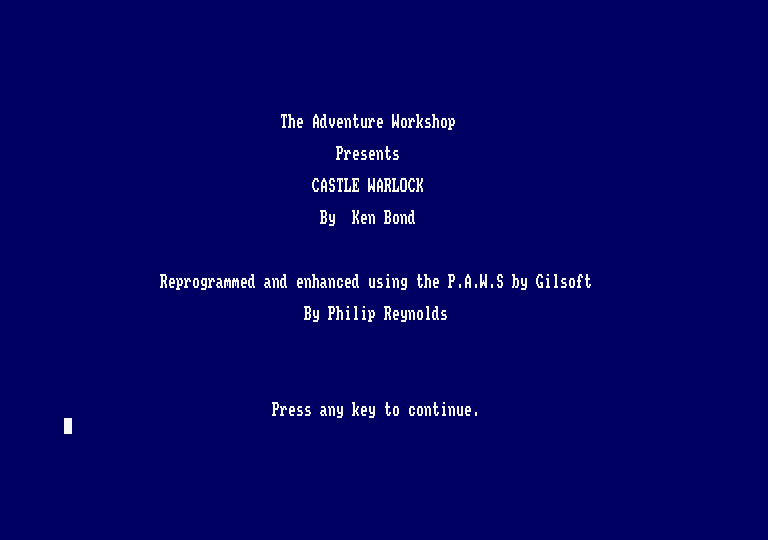 You start off trekking through the countryside with your guide on your way to Castle Warlock the home of the evil Danzil, to solve the puzzles and traps which the castle contains. As you proceed towards the Castle a violent storm develops and you decide to shelter under a tree. Unfortunately, lightning strikes and hits the tree under which you are standing, when a branch breaks off and hits your guide and kills him. You search your guide to check that he is In fact dead, when you find that he is carrying a piece of paper which contains some writing. Apart from the bit of paper, you are well and truly on your own. You have now to find your own way to the castle and solve the problems therein. The first complication is getting into the Castle after you have found it, but before you do enter the castle, get some garlic from the side of the dry moat, read the paper and find an old coin which you need to drop in the well. You now should know all you need to get into the castle. When you get into the castle there is a hungry vampire bat around, and having garlic will be a help! The cupboard in the armouiy is a lift, just say "up" and you will go to the next floor, but don't forget your garlic. When you open the chest in the armoury, you must be using the shield. To get the shield, stand on the chair. To get the gold key from the cell, drop the chair to stop the ceiling crushing you flat like a kipper. To find the way out of the room of mirrois, just pull the curtain and you will see the exit. Use the block of wood to jam the spiked door in the mirror room, then go north and take the key. You have now been given a sample of the problems which the adventure poses, and how to deal with them. The rest Is up to you. » Topic: Cheats, pokes ou solution pour "CASTLE WARLOCK"